We find this charming traditional Spanish house with touches of Ibiza style in the peaceful residential area of Mas Mestre, just a short drive away from Sitges centre, the beach and reputable international schools. Perched on a hillside, the house enjoys fabulous mountain views from its very attractive garden with a salt water pool, barbecue and pizza oven. 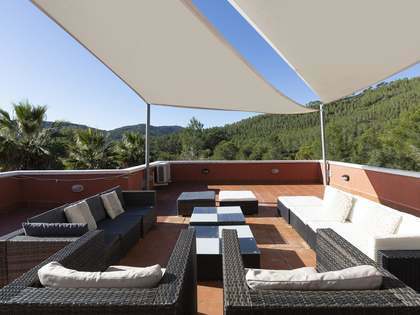 The terrace offers a fantastic summer lounge area with lovely views and plenty of privacy. One of the highlight of this property. Inside the house we find a comfortable living and dining room with a fireplace and access to the terrace, as well as a modern, fully equipped kitchen. The first floor, which also has a terrace, offers a spacious master bedroom with an en-suite bathroom, 2 double bedrooms, a single room and 2 family bathrooms, one of which has a glamorous, free-standing bath. On the lower ground level we find the utility room and a garage. Built in 1979 and fully renovated in 2014, the property is ready to move in and has been renovated with excellent taste, creating a very comfortable family home. 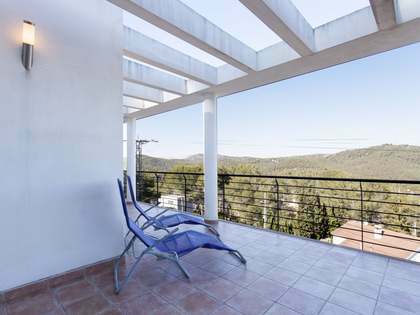 It would be well suited to a family that would like to have a peaceful home in natural surroundings, outside of then busy centre of Sitges but still enjoy easy access to it. It also boasts good holiday rental potential. Fully renovated and sold furnished, this 4-bedroom house with a pool and magnificent views would make an enviable home near Sitges. 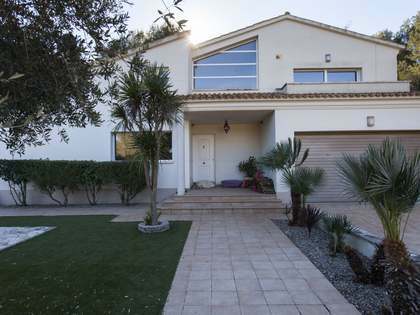 Property located close to Sitges, in the quiet residential area of Mas Mestre, close to international schools. 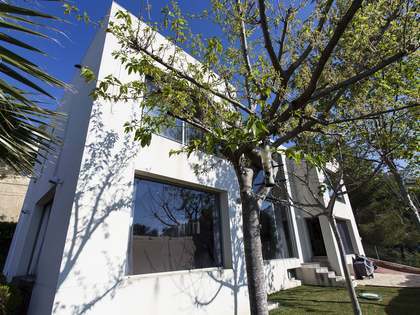 It is a 15-minute drive to the beaches of Sitges and the town centre.